One of the distinctive features of Chicago, Illinois is the elevated portion of its ‘L’ transportation system which includes a section of elevated tracks which encircle the area known as ‘The Loop’. This particular shot shows the junction at Lake and Wells streets. The photograph was taken from the rooftop deck of the Randolph Tower City Apartments. The building was open to the public during Open House Chicago 2013. My wife and I had an opportunity to visit the Chicago area recently. We were in town for a tour sponsored by the Frank Lloyd Wright Preservation Trust” called ‘Wright in Racine’. The trip took us to Racine, Wisconsin where we were able to tour Frank Lloyd Wright’s “Wingspread”, the home for Herbert Johnson of S.C. Johnson Wax, as well as the Johnson Wax Administration Building. After the tour we spent some additional time in the city of Chicago. One of the great places to visit in Chicago is the Art Institute of Chicago. This museum houses a great collection of art. 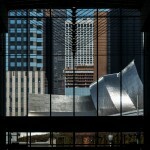 While we were visiting, I noticed this shot looking out of the museum toward Millenium Park. The way the lights were hanging and the way the windows were shaped, I was reminded of the leaded glass windows that Frank Lloyd Wright had designed for the Darwin Martin House in Buffalo, New York. The windows had a pattern that Wright called ‘The Tree of Life’. With a bit of a crop, this shot from the museum reminded me of those windows. 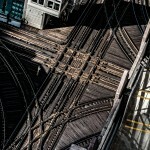 This summer I participated in the Google+ 1 year anniversary photo walk in Chicago, Illinois. I hadn’t been to Chicago in quite a while and it was a good chance to see the city and meet some talented Chicago area photographers. 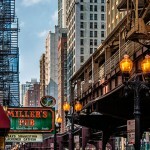 At the end of the day, while walking back to my car, I spotted this shot of Miller’s Pub on Wabash St. I liked the way the sun was shining on the taller buildings in the background combined with the ground level details such as the fire escapes and the supports for the ‘L’ train.